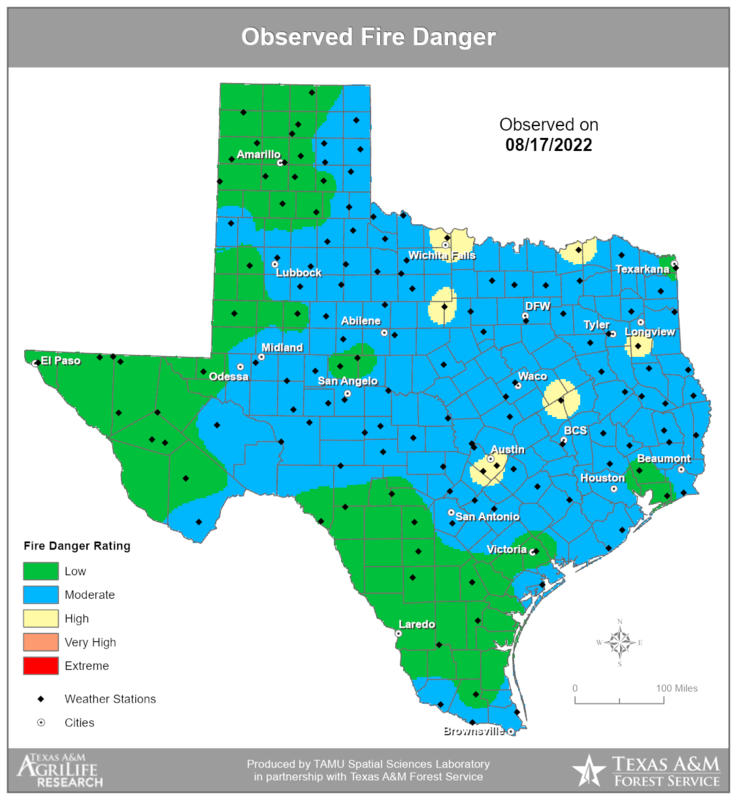 The Texas Fire Danger Map is a real-time mapping project designed to display current and forecasted fire danger levels throughout Texas. Weather information is provided by remote, automated weather stations and then used as an input to the Weather Information Management System. The National Fire Danger Rating System processor in WIMS produces a fire danger rating. Refer to the Fire Danger Fact Sheet (PDF, 10KB) to gain a better understanding of fire danger ratings and their recommended usages. When the fire danger is low it means that fuels do not ignite easily from small embers, but a more intense heat source, such as lightning, may start fires in duff or dry, rotten wood. When the fire danger is moderate it means that fires can start from most accidental causes, but the number of fire starts is usually pretty low. If a fire does start in an open, dry grassland, it will burn and spread quickly on windy days. Most wood fires will spread slowly to moderately. When the fire danger is high fires can start easily from most causes, and small fuels (such as grasses and needles) will ignite readily. Unattended campfires and brush fires are likely to escape. Fires will spread easily, with some areas of high-intensity burning on slopes or concentrated fuels. Fires can become serious and difficult to control unless they are put out while they are still small. When the fire danger is very high fires will start easily from most causes. The fires will spread rapidly and have a quick increase in intensity, right after ignition. Small fires can quickly become large fires and exhibit extreme intensity, such as long-distance spotting and fire whirls. These fires can be difficult to control and will often become much larger and longer-lasting fires. When the fire danger is extreme fires of all types start quickly and burn intensely. All fires are potentially serious and can spread very quickly with intense burning. Small fires become big fires much faster than at the "very high" level. Spot fires are probable, with long-distance spotting likely. These fires are very difficult to fight and may become very dangerous and often last for several days.